I have prepared this Red chilli pickle on Public demand. The hot and spicy Red Chilli Pickle spice up every meal.This recipe is specially inspired by my Grand Mother(Nani Ji)’s recipe. I have modified and simplified it so that we can prepare the same pickles with less efforts..The taste is awesome and mouth watering , I have used same masala mix to make four different type of red chilli pickles. Take a sharp pointed knife ,to take out the inner parts or innards of the chillies including all seeds.Take all seeds in the mixer and grind for 30 seconds. Now keep the red chillies and seeds under the sun for 2 to 3 hours.So that there should be no moisture left. Now lightly roast mustard,fennel,coriander and fenugreek seeds one by one and keep aside.After cooling down make a coarse powder of these roasted spices. In a big bowl take this roasted spice powder along with turmeric and red chilli powder, both salt,carom and onion seeds,dry mango powder,mustard oil ,lemon juice and mix well. Now stuff the red chilli with spice mixture.I used the back side of the wooden spoon for stuffing the chillies and keep aside all stuffed chillies. Take the clean and dry jar,make a position of jar upside down.Then put 1 teaspoon asafoetida on any small pan and roast it,then turn of the flame.the fumes coming out from asafoetida take the jar there, so that fumes go inside the jar and close the lid for few minutes. 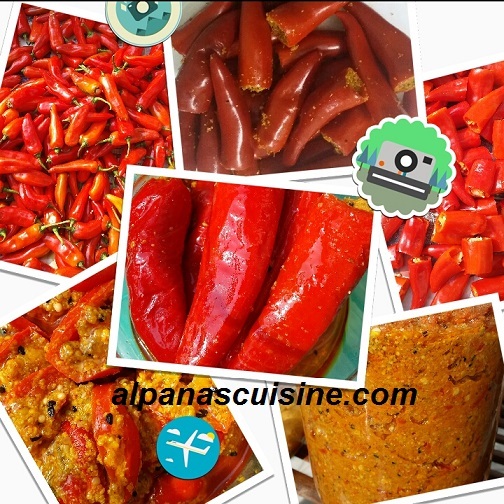 Now take the remaining oil in a bowl and dip the stuffed red chilli one by one for few seconds.Then arrange all the stuffed chillies in the jar with its open part upside . Keep the jar under the sun for 2 to 3 days. Chopped Red Chilli Pickle -Make a coarse paste or chopped red chillies in a mixer grinder.Then add spice mix,oil,and vinegar,mix well and keep in a jar. Sliced Red Chilli Pickle-Cut the red chillies in circle and mix with spice mix .The process is same as the chopped red chilli pickle. Pickle Of The Crown Red Chilli -Do not throw the green stock with red part, take the red part of the crown of the red chilli and mix small amount of spice mix in it,with the same process as chopped red chilli pickle. Always add enough oil and salt to the pickle as it helps to preserve the pickles. Always keep pickle in dry and tight container. After packing the jar with pickle,always topped the jar with oil and vinegar as it works as preservative. Do not put the Stuffed Red Chilly Pickle under sun light more than 3 to 4 days because it chane the colour from red to dark red.